← Ecclesall Road tree threat – petition to sign please!! You may recall the Peak District ‘deer watches’ we organised (red deer at Big Moor and both red and fallow deer at Chatsworth, for beginners); held with deer expert Andy Alder. 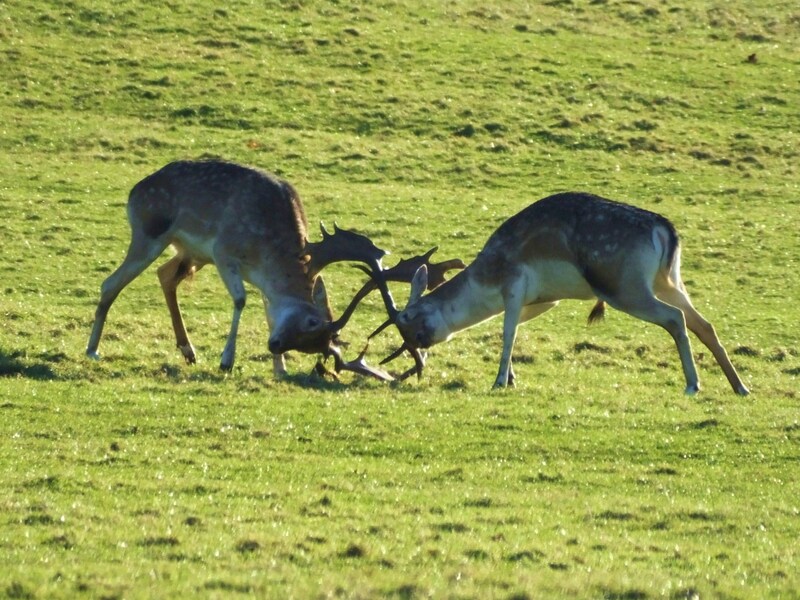 The latter were to catch the key part of the deer ‘rut’, the annual cycle of males displaying and mating. This spectacular process begins late September and tails off into mid-November. Both fallow deer and reds behave similarly in terms of seasonality and timing; by late November it is, as they say, all over bar the shouting. 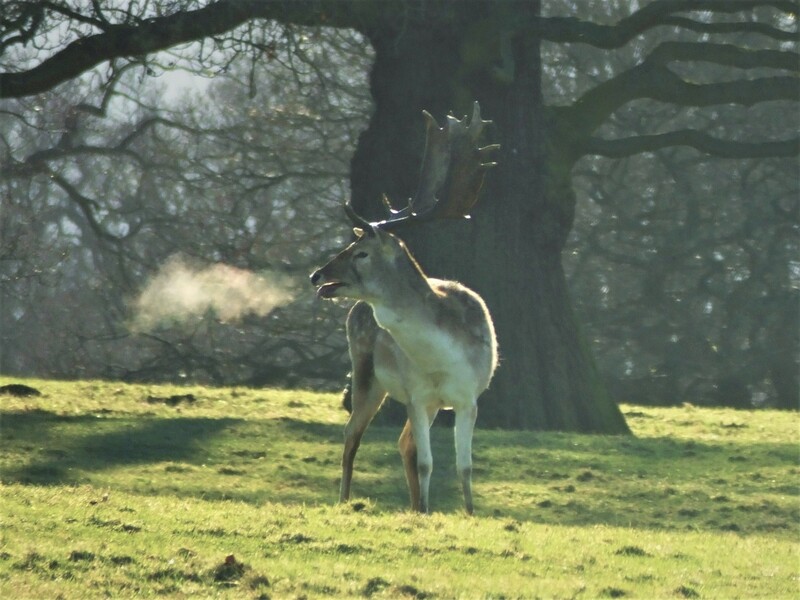 Males shed or cast their antlers towards the latter end of winter and the process begins again with antlers in velvet re-grown over the summer; the animals feeding back up and into good condition for the autumn rut. Fallow bucks are smaller than red stags but have rather splendid ‘palmate’ antlers with prongs emanating from the palm of the growth rather like fingers from the palm of your hand. 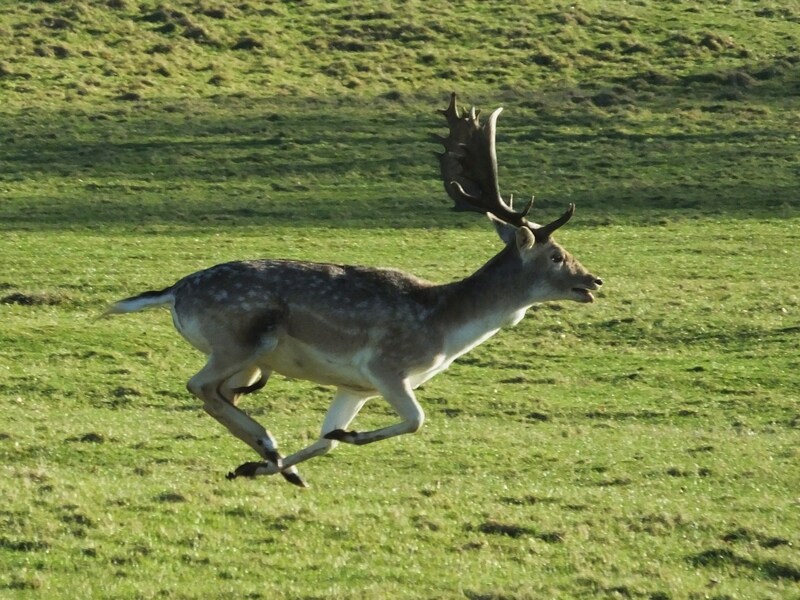 Fallow deer were the beasts of choice for deer parks, from the Romans to the Normans, and then throughout the medieval period up to the time of the great landscape parks; they are less spectacular than reds but much prettier. They are naturally herd animals and easy to manage in enclosed park area. I recently noticed some of Chatsworth fallow bucks together in small groups, in some cases at least, apart from the females. You may recall how red deer stags round up and protect from all comers, a harem of hinds. They roar loudly at intruding males and will, if necessary, enter serious conflict to protect mating rights. Generally, outright battle is avoided as weaker, subservient males can tell they have no chance of victory and sensibly slope off to fight another day. Fallow bucks do things differently and have two main characteristic to their rut. One stratagem is to select and defend a particular tree or shrub and in their excitement they give this a severe bashing with their antlers. At their chosen ‘rutting stand’ they paw the ground and wallow in mud-baths whilst roaring (called ‘groaning’ and likened to a belching snort) to proclaim their attractiveness and masculinity. This attracts both females to mate and rival males to be chased off. In some cases, bucks may search out doe groups and mate opportunistically if the chance arises. During this period, the rutting bucks may stop feeding and lose condition. In some cases, they fail to recover sufficiently to last through the following winter if the weather turns bad. If the does fail to conceive at first, they may come into season again, and this may be the case with some of the Chatsworth animals. Certainly, as reported by Kirsty and confirmed in her photographs, the bucks were getting very frisky and were once again displaying and rutting. Maybe the mild weather has also had something to do with late activity although it does seem that the does were not in the least bit interested! Watch out if you are around Stanton-in-the-Peak or the Darley Dale and Matlock area because there is a now well-established black (melanistic herd of medieval origin) fallow. These animals regularly com into local gardens and here you can help my studies. I need two things – 1) records and sightings and 2) some photographs. Do let me know!